You’d be hard-pressed to find a kid (and adult!) that doesn’t love spaghetti, so this veggie-packed sauce by Kayla from My Lovely Little Lunchbox is perfect for fuelling your little ones and sneaking a little extra goodness into them without them realising it! It’s perfect for freezing too so you can keep it on hand for a super easy mid-week meal for the whole family. Bring a large pot of water to the boil, add spaghetti and cook according to packet instructions. Drain and set aside. Heat a large non stick frypan over medium-high heat. Add olive oil, sweet potato, carrot, zucchini and garlic and cook (continually stirring) for 10 minutes – or until the veggies have softened. Add a splash of water whenever the veggies look too dry. Add passata and stir to combine. Turn heat down to low and simmer for 10 minutes or until the sauce has thickened slightly. Divide the sauce into two portions (freeze half for a later day). Add the cooked spaghetti to the remaining sauce and toss to combine. 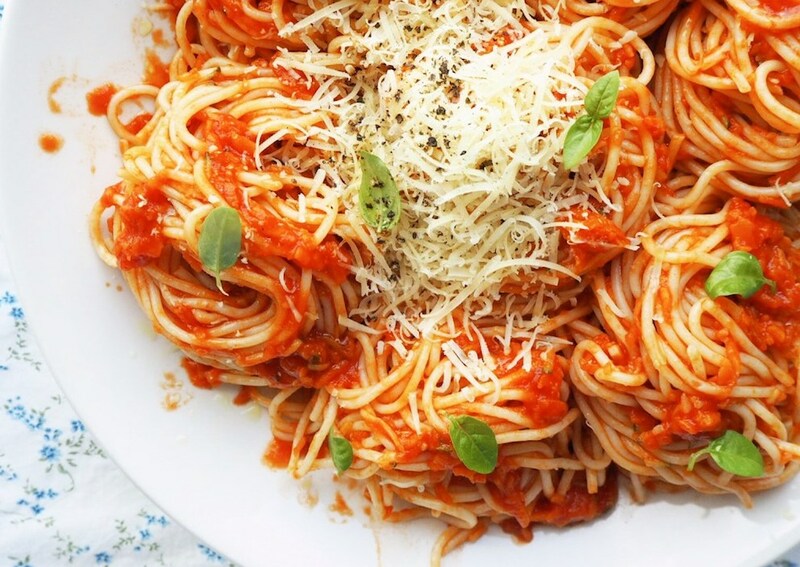 Place spaghetti onto a large serving platter, top with grated parmesan and basil leaves. Kayla from My Lovely Little Lunchbox is a wife, mum and home cook dedicated to helping you create and eat delicious food at home with your kids – even if you don’t know how to cook! We are what we eat. Food is how we fuel our bodies, how we celebrate life and how we connect with our friends and family. Kayla believes that the time we spend together is just as important as the food we eat. Cooking together and sitting down to share what you’ve created makes your family happier – it’s your way of finding the joy in the ordinary and celebrating everyday life. Head to mylovelylittlelunchbox.com or follow her on Instagram @mylovelylittlelunchbox for more.